At this point, my fairy tale retelling obsession is a matter of blog record. I don't know what that says about me, except that Robin McKinley and Jane Yolen converted me early on, and there's no hope for a change at this point. *grin* Not that I'd want to change! In the past year I've enjoyed reading the first two installments in Lili St. Crow's A Tale of Beauty and Madness series - they're interesting twists on familiar tales, and the sort of book you read in one (happy) bite. I reviewed Nameless, and though I didn't review Wayfarer, rest assured that I gobbled it up, too. 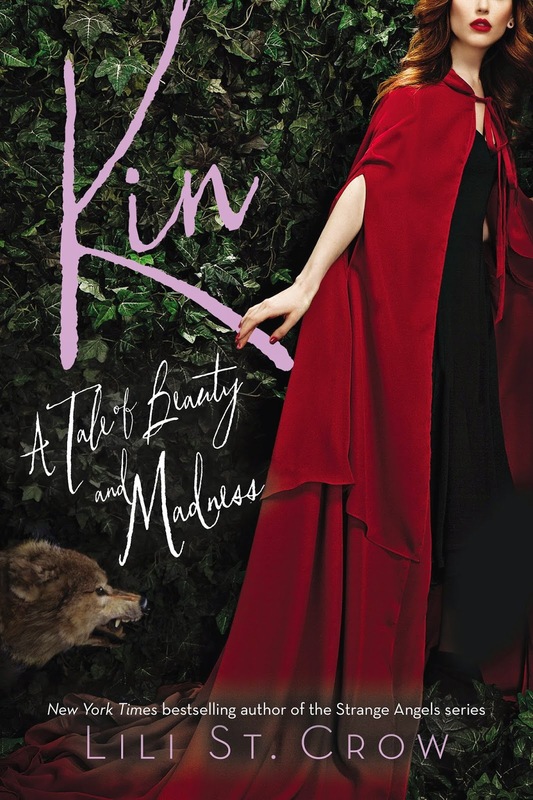 The final book in the trilogy, Kin, will be released by Razorbill (Penguin) on March 3, 2015. New York Times bestseller Lili St. Crow stuns once again with this enchantingly dark retelling of Little Red Riding Hood. In the kin world, girls Ruby’s age are expected to settle down and start a family. But settling down is the farthest thing from wild-child Ruby's mind--all she wants to do is drive fast with her friends and run free through the woods. Then Conrad, a handsome boy from a clan across the Waste, comes to New Haven to stay with Ruby, and the sparks fly immediately. Conrad is smart, charming, and downright gorgeous. Ruby gets to know him more, she begins to realize something's...off. Like most kin boys, Conrad's temper can be a bit...short. But does he have to be so rough with Ruby--to the point of leaving bruises? On top of all that, Conrad seems to be isolating Ruby, until he all but forbids her from seeing her best friends Cami and Ellie. Get ready to surrender to Ruby's charm in this mesmerizing third and final installment of Lili St. Crow's Tales of Beauty and Madness series. I own the first book but still need to read it. I am such a book hoarder. LOVE retellings, and this one sounds good! Nice WoW pick! I haven't heard of this trilogy before but it looks amazing!